CONTROL Overload Pty Ltd’s Model 3510 is a hermetically sealed, stainless steel shear beam. Designed for the ultimate protection necessary for today's hostile environments, it is suitable for low profile platforms, pallet truck weighers, tanks, hoppers and silos. 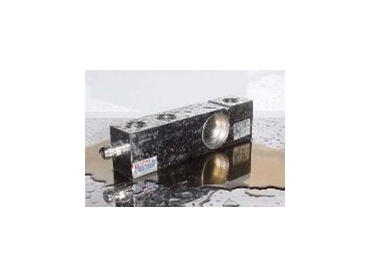 This high accuracy load cell is hermetically sealed to IP 68 and is OIML Class C3 approved. When operated at constant temperature, all load cells offer ±0.02% combined error performance regardless of accuracy class. Hermetically sealed, stainless steel construction assures long-term stability even under harsh environment and extreme temperatures. The slotted profile enables manufacturers to easily position the load cell without resorting to the use of mounting plates. For tank or hopper mounting applications, the Model 9100 Series ‘Cell-Mates’ mounting kits are available. Cell-Mates simplify mounting while increasing system accuracy.